Watch your pressures. 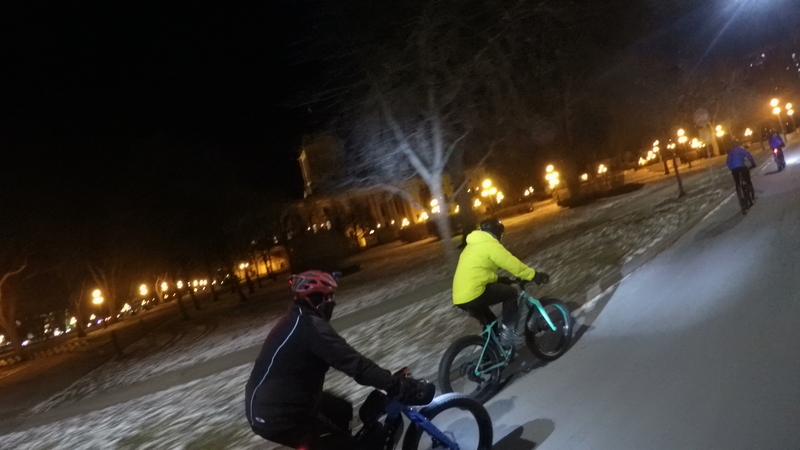 Husker Dus 3.8s are good on the summer pavement, good in winter in a straight line, but on an off-camber descent, be careful, because there is ice on the trail. Yes I wiped out. Nothing major. No broken bones. I feel it’s good to wipe out, for if you do not get hurt too badly, it keeps your ego in check. I will be switching to 4.8s Lou/Lou unstudded combo that came with my 2015 Blackborow. Great tires. Now is the time for the winter gear. 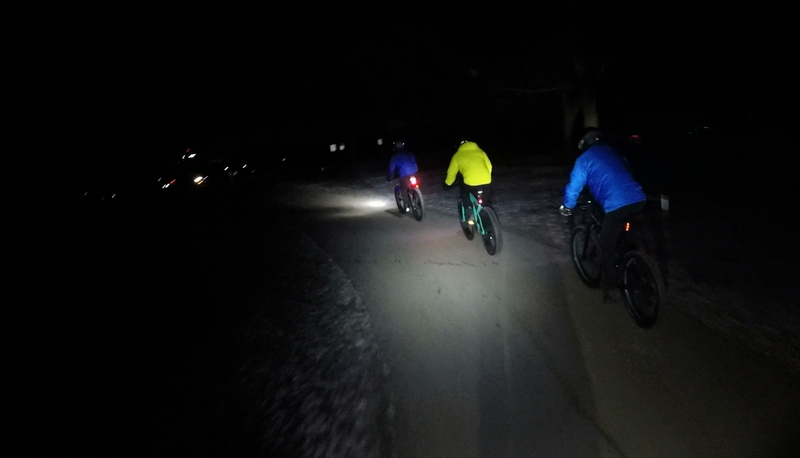 The Thursday night ride with the Woodcock Cycle club was a blast! 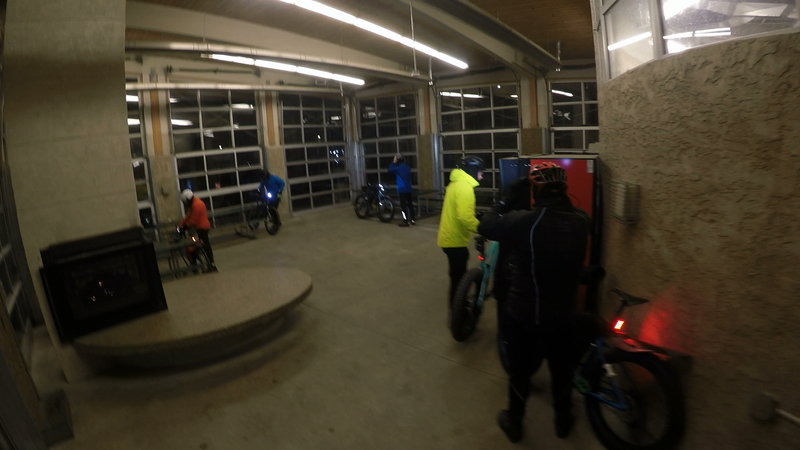 Tim made sure everyone was safe, and the ride was short and brisk. 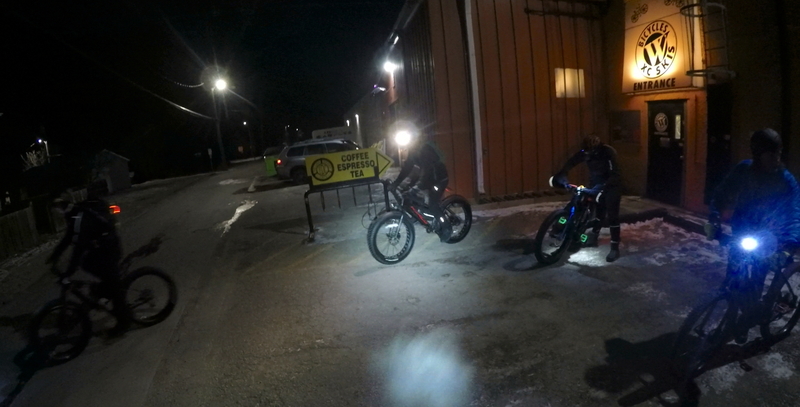 We traveled North from the shop, first on Gabrielle Roy, then Whittier, Forks, and then back South down Churchill, over the St. Vital bridge, and back to the shop. It was a no drop ride so we stopped and chatted. Everyone was in good spirits. Thankyou Coach Nic! See you next Thursday! 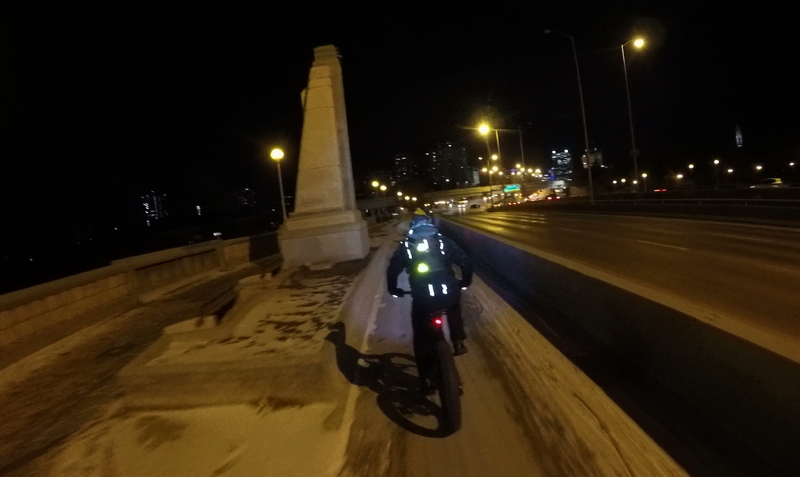 7th Annual Winnipeg GFBD Ride – Sat Dec 1st 2018: It’s going to be a Huge Blast! 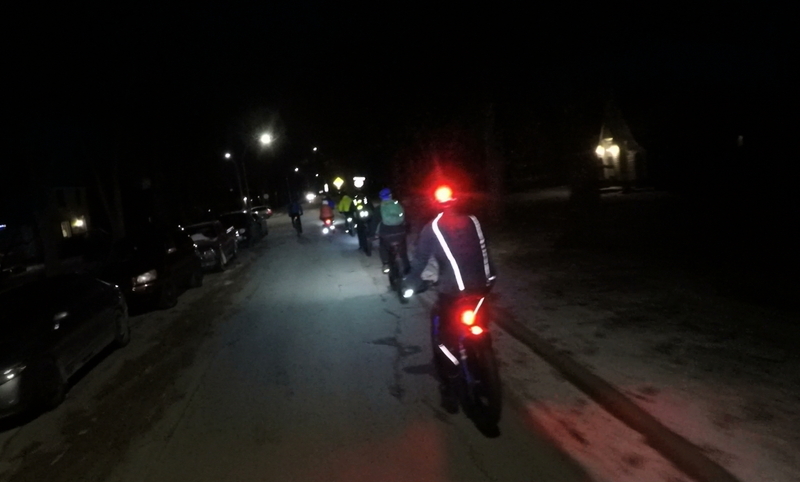 Four days ago, I announced our Wpg GFBD Ride Leader’s Team plans and invited local fatbikers with a Public FaceBook 2018 Wpg GFBD Ride Event and we already have over 100 looking at attending! That’s a larger number than in previous years when 100 riders actually joined the ride. In fact, because there are plenty of riders who are not on social media or chose not to commit until a few days before GFBD, it sure looks like this will be our biggest. 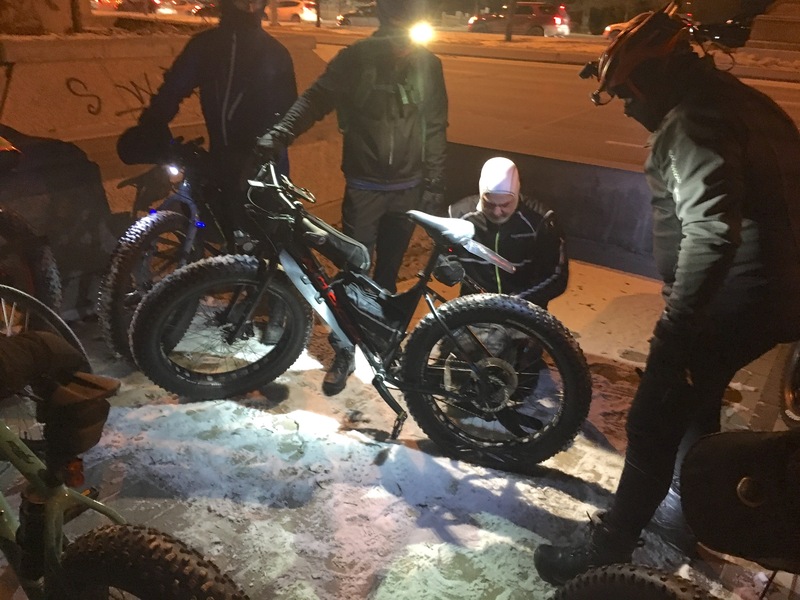 No costs … just bring a smile, your fatbike (borrow or rent one – but we are inclusive, so a MTB can work for most or all of the route and you can parallel the Seine River on roads if necessary), toque and a helmet of course (silly helmet covers are always welcome 😜). Here’s the ‘Media Ride’ section from the Forks ‘Canopy – Atrium’ start to the East side of the Red River across from the St Boniface Cathedral via the Esplanade Louis Riel Footbridge. Riding down from the Forks Market area. Here’s Keith Holm (orange helmet) leading our ride up towards the CMHR. 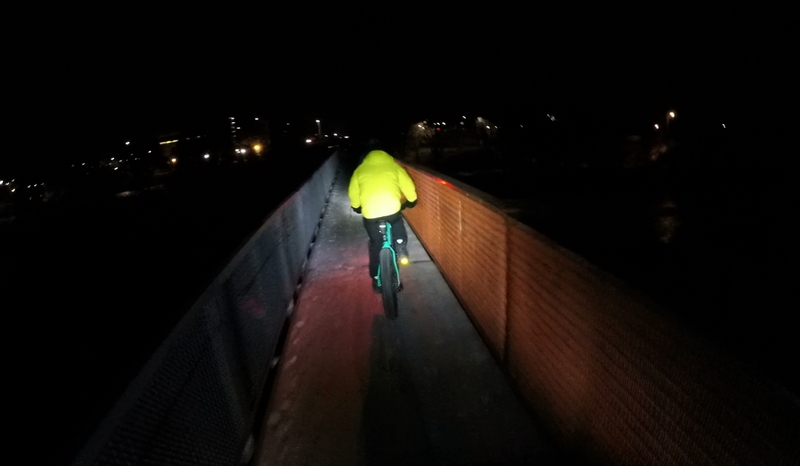 High Fives (and Low Fives) are always welcome as we cross the bridge. 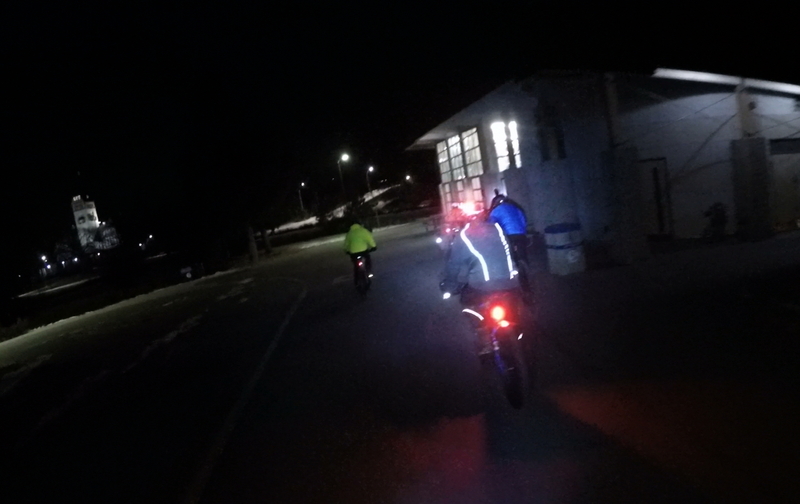 Here’s one of our ride guides Guy Anthony (yellow bike) leading the way. 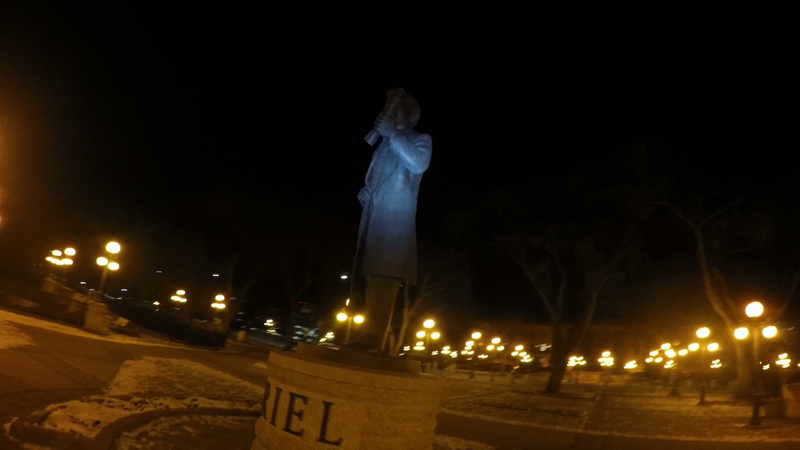 … at our usual Group Photoshoot on the East side of the Red River down from the St B Cathedral, where our very own super Fatbiker-Photographer Gregory McNeill will be waiting to capture our now-classic Winnipeg GFBD group photo. After our group photo we will head of on the same route as last year as one group (about 90 minutes from the Photoshoot to the Chilifest Pitstop). This the same route as last year and it worked really well. Great picture taken by Blake Anderson (he climbed the old toboggan tower by Whittier Park)! Riding the Whittier Park single-track trails. Riding the Seine River single-track trails. Marion Street crosswalks (light controlled). 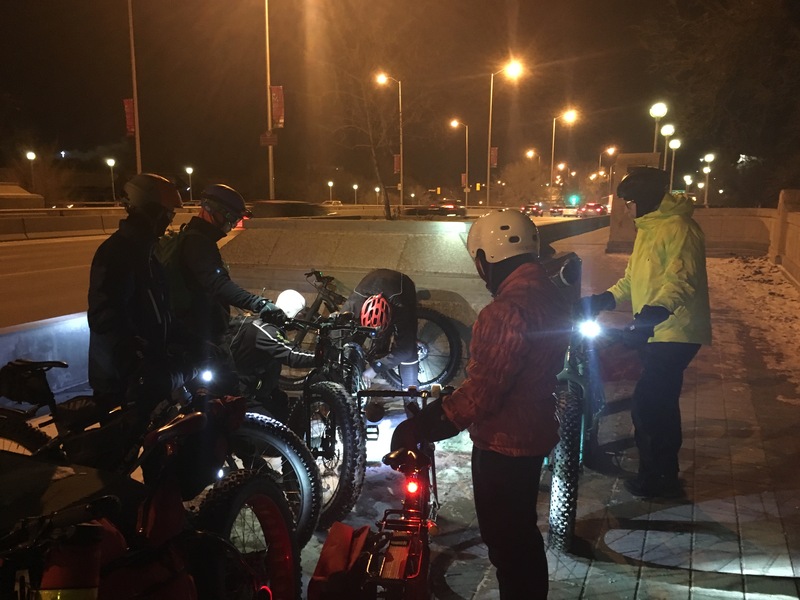 Here’s some of pictures of us riding onto the Seine River taken by our Official GFBD Photographer Gregory ‘G-Mac’ McNeill who will be active again this year. Here’s a great view of us riding onto the Seine River captured by Blake Anderson. 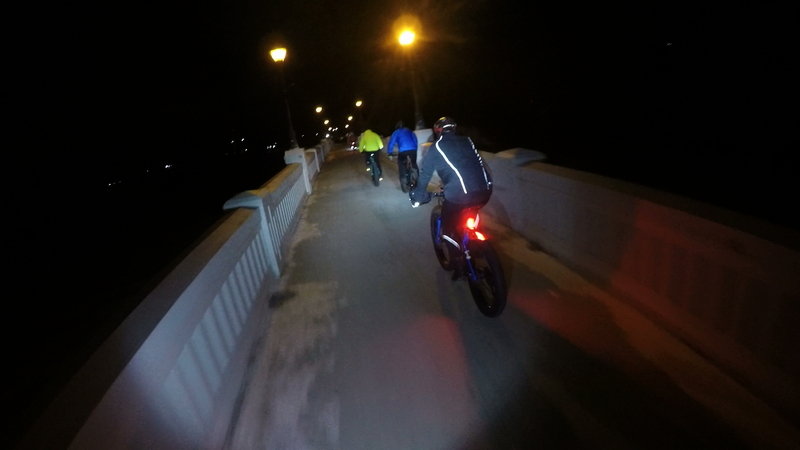 Solid frozen/firmly packed snow conditions last year made our ride on the Seine River ideal! Here we are reformed as a group on the Seine River. 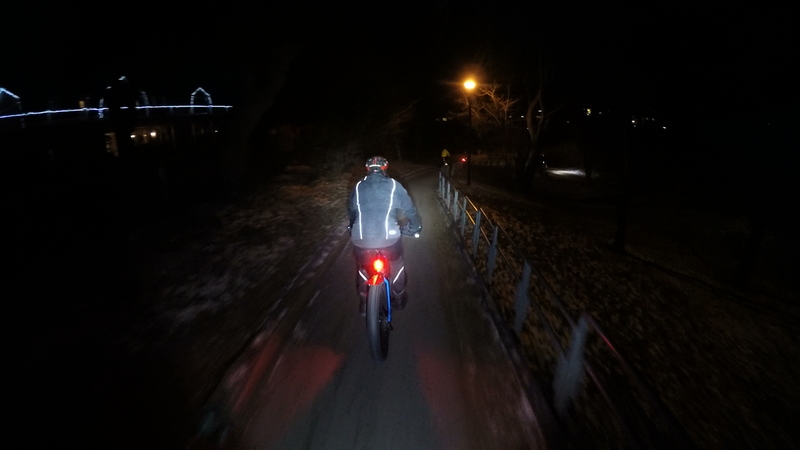 … leading to our “Chilifest” pitstop at a fatbike-friendly home on Kingston Crescent near Kingston Park (arrive +/- 2:00-2:15 PM). After ‘chillin’ time, you can head home or back to the Forks via Churchill Parkway directly to the Forks (30 minutes) or head homeward as best suits you. We will have guides heading back to the Forks leaving the Chilifest pitstop at 3-ish, 3:30-ish & 4-ish. This year we are fortunate to have the Safety Support from Robert Paige of Xtreme Sports Medics. He and his Medics Team will be following our route with his fully equipped Medical Vehicle and always ready to respond (not that we should need their help). 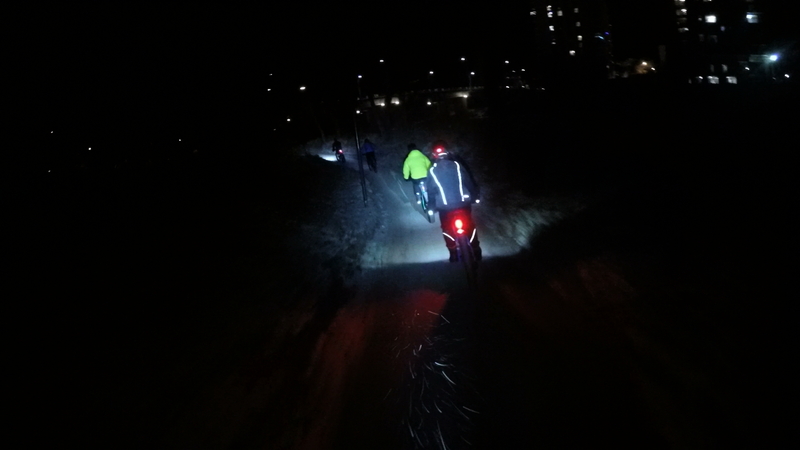 *Btw 2, like last year there will be other riders and groups that will likely meet up in their part of the city to ride as a group to the Forks to join in or who may wish to have a group ride after our Wpg GFBD Ride – excellent, the more the better. 1. 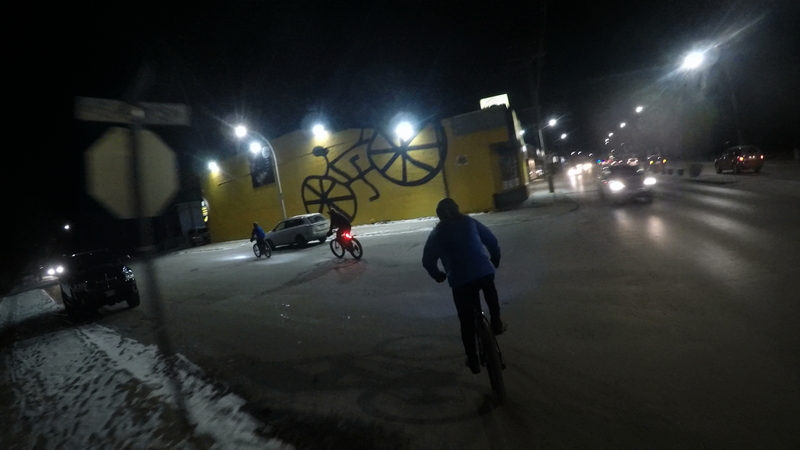 There is usually a group that rides in from the NE (Transcona). 2. 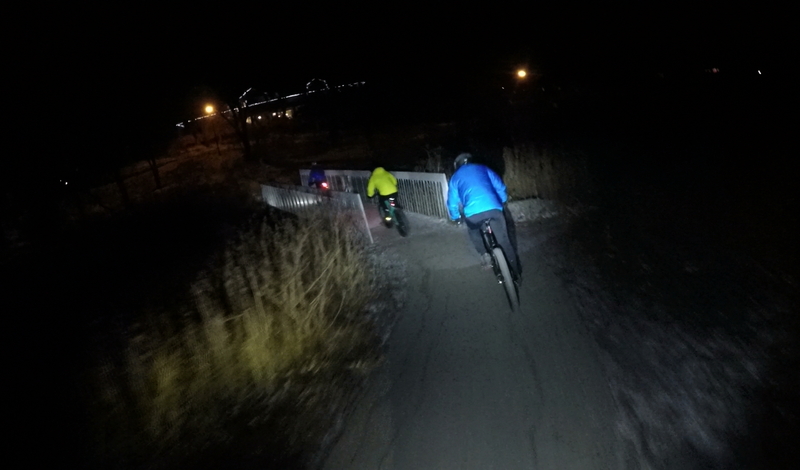 There are a number of guides and riders who are planning to meet at the Elm Park (BDI) Footbridge at 11:00 AM to ride to the Forks – Keith, Chris and I will be with that group. 3. 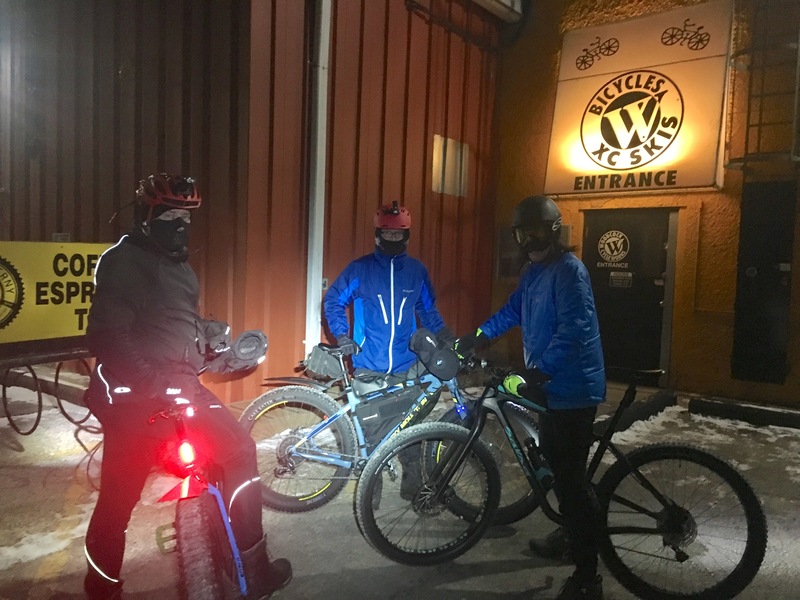 There will be a group riding from Woodcock Cycle Works (WCW) on St Mary’s to ride to the Forks – Nic Robitaille is the WCW Lead Guide. 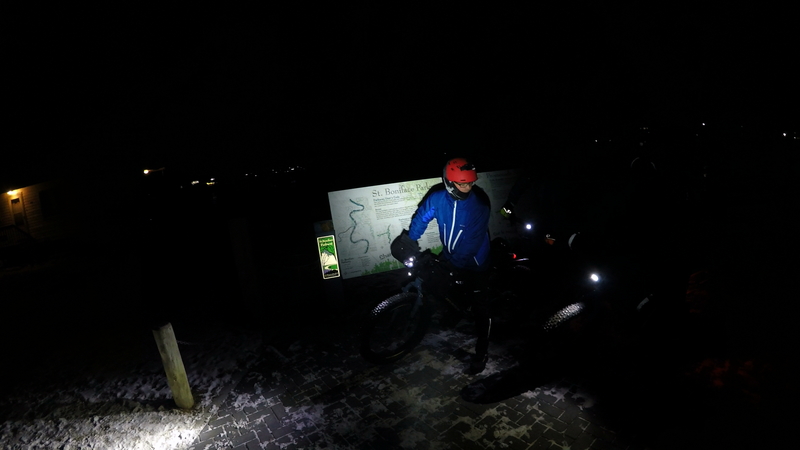 Any questions or route conditions updates, please make a comment or email me through the ‘Contact Form’ on this site.